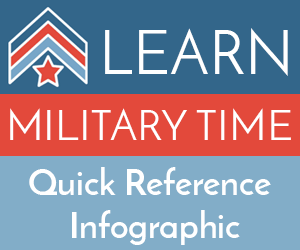 This is how the military time clock widget will look on your site. It uses the visitors time from their device to convert and translate it into military time and back if needed. There are two versions of code below. One includes styling and one does not. It you have difficulty with the visual appearence of the widget then use the code snippet that does not have any styling. From there you can add in styling as needed. If you are having trouble getting the clock to look right on your site then start with this code and adjust with styling as necessary. Read more about styling HTML.